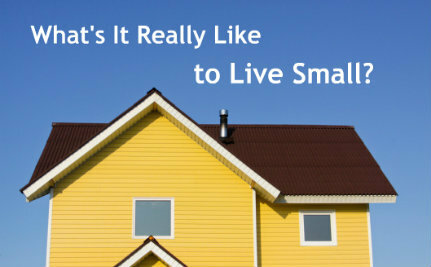 Care2 Causes | Tiny House Tell-All: What's it Really Like to Live Small? Tiny House Tell-All: What’s it Really Like to Live Small? Last week I posted a list featuring 8 of the tiniest houses ever built. In recent years, the green design and sustainable living communities have become obsessed with these small dwelling places. There are scores of blogs and forums dedicated to sharing interesting designs as well as building plans. Countless gallery posts feature stunning images of these adorable abodes, showing us their pristine interiors and smart exteriors. But as my colleague Anna Brones recently asked in a column for EcoSalon, is this obsession with tiny houses more than skin deep? In short, we all like looking at tiny house designs, but they only matter if we embrace the philosophy behind them. So instead of trying to inspire you with pictures, I decided to reach out to some individuals and families that actually live in tiny homes. Their experiences reveal the oft-untold story of small living: what it’s actually like to live in just a few hundred square feet, with even fewer belongings. Although there are definitely challenges, most tiny house owners say they’re far outweighed by the physical, mental and financial benefits. 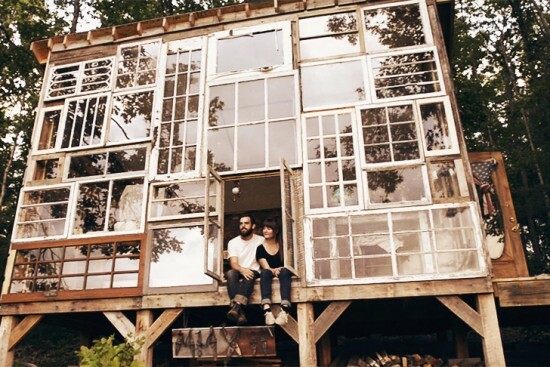 Lilah – She and her partner built this amazing tiny house made of recycled windows in the hills of West Virginia. Corinne – She built her tiny home in Vancouver, BC, because she needed a place to heal from Chronic Fatigue Syndrome. 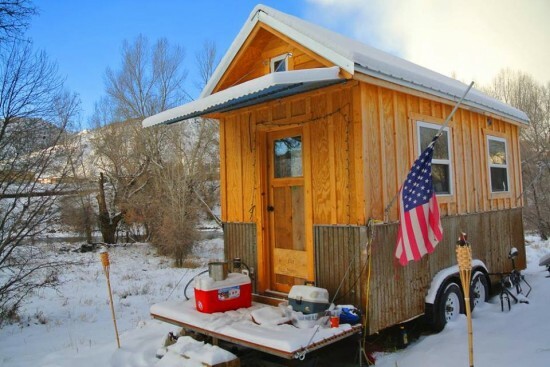 Greg – He created his tiny house in Durango, Colo., to ditch his costly bills and gain the flexibility to live wherever he wants. Jamie – Built a tiny house in Calais, Vt., because the thought of living under a huge mortgage was too much to bear. 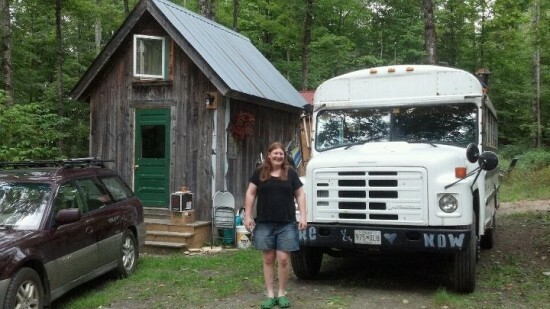 Kelly – She and her partner converted a 1991 Ford Thomas school bus into a tiny house on wheels. The first thing I learned from this panel of experts is that you should never pursue tiny house living without a clear reason or inspiration. Because it’s cute or trendy doesn’t count. In most cases, the process of designing and building a microhome is long and fraught with unexpected difficulties. Each person I interviewed had a single point in time or pressing need that fueled their motivation through the uncertain times. It could be wanderlust: “I was sick of paying rent and wanted something I could live in for a few years and abandon if I decided I wanted to do something drastically different with my life. I travel a lot and thus wanted something I could just leave,” explained Jaime. It could be the desire to stop consuming: “When you have too much space you end up with too much unwanted stuff! Small homes make you own only the most important things you love,” says Lilah. It could be a quest for freedom: “Living simply, having no mortgage, very little bills, [and the] flexibility of being able to move it,” says Greg. Why is it that we (almost) never see people in images of tiny houses? And why is it that they always seem pristine, with everything in their right place? This isn’t what small living is really like, explained our panel. 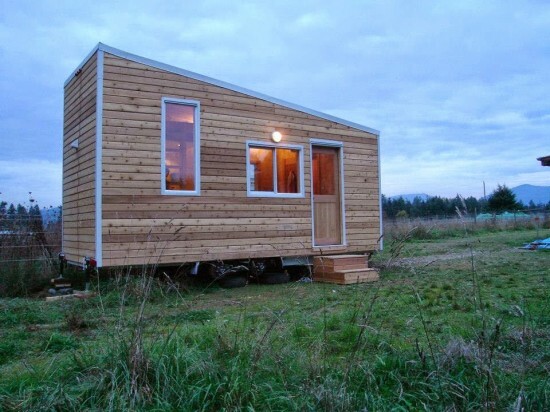 To thrive in a tiny house, you’ve got to be ready to do the work. “There are a few functions I like to do year round that are difficult to do in the winter when the weather forces me indoors, i.e. doing yoga, entertaining guests, etc. Sometimes I wish I had an extra room for these functions,” agrees Greg. By now you might be thinking, “This sounds hard. I don’t know if I can give up dinner parties and family gatherings.” But before you resign yourself to all the trappings of a big house life, realize that there’s a flip side to these challenges: the blessings. Clarity and contentment follow Kelly and her partner wherever their bus takes them. “Everyone lives somewhere but typically where you live is not really part of your identity. 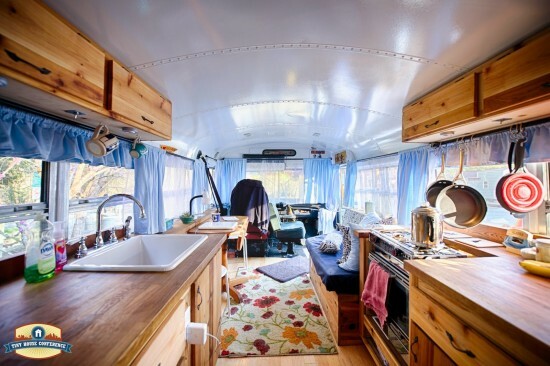 When you live in a tiny home (or school bus) it becomes part of who you are. Since our home was built by us and specifically for us it has a more meaningful place in our lives,” she explained. You might also be surprised to learn that stronger relationships are also a blessing of a microhome. “You spend more time with your partner (co-inhabitor),” Lilah explained, and without the distractions of all the space and stuff that makes up a big home, it’s more meaningful interaction. If you’re serious about downsizing your life, and swapping your big house for a tiny one, it’s necessary to make some mental and physical preparations. The Humanure Handbook: This book “is fabulous, entertaining, and a must read for designing a non-traditional composting system. [It] really helped me design and build my own system, eventually based off the general model of the ‘Lovable Lou,’” Jamie said. Corinne says the book “Little House on a Big Planet” helped her study and map her spacial needs, while “Prescriptions for a Healthy House” guided her chemical-free build. “Read Lina Minard’s account of completing the 200-thing Challenge,” says Greg, “and check out ”Radical Simplicity” by Dan Price.” As an expert, Greg is also available to answer questions via his website. According to Kelly, some of the best advice and assistance can be found on the internet. She suggests taking a look at Tiny House Swoon (for lots of pictures and inspiration), seeking out online tiny house communities and forums (to create relationships with like-minded people), and starting a personal blog or Facebook page for your tiny house dream. “By posting on our blog and Facebook page we received regular support and assistance while building the bus. This helped motivate us to keep working, even during some significantly challenging times,” Kelly said. Thanks. I am not sure about 150 sq feet to live in, but we definitely do not need the big houses that everyone is building these days. Leave some space for mother nature! My idea of tiny would be around 500 square feet, no smaller. Need a bit more room for an art space and some for exercise/Yoga. Thanks for a great article, many good ideas. Nice, but as enchanting as the tree tiny house looks I think it might be way too cold to live in during the winter. My idea of small would be in the region of 900-1000 sq ft. Tiny does not appeal to me under any circumstances because I can't imagine living without books and works of art.